Pioneer compact car distributor Suzuki Philippines continues to build on its successes this year with feature upgrades for the Suzuki Celerio and Alto. These two well-known Suzuki subcompact cars are redefining comfortable and enjoyable driving by guaranteeing peace of mind with their new safety features. Celerio, the country’s most fuel-efficient car in the gasoline category according to the Department of Energy, ups the ante in terms of safety by combining it with comfort to guarantee worry-free driving. The latest updates to the Suzuki favorite aim to ensure a more peaceful drive through greater driver and passenger safety. The Celerio now features a reverse parking sensor, which promises easier reverse maneuverability. Celerio models also come with the Suzuki Total Effective Control Technology (TECT), which makes effective use of high-tensile materials to achieve a high-rigidity, low-weight body for greater collision safety. The Celerio boasts a fuel economy rating of up to 29.14km/L, the best in overall fuel rating for gasoline category, based on the Fuel Economy Run organized by the Department of Energy (DOE) in partnership with Petron Corporation. Besides fuel efficiency, the Suzuki classic features enhanced entertainment capability, including a new 7-inch Multimedia Touchscreen Audio System for a more enjoyable ride. The model still features dual airbags both in the driver and passenger seats and anti-lock brake system (ABS), making driving a truly safe and comfortable experience. The upgraded Celerio is available locally in Pearl Snow White, Metallic Star Silver, Metallic Mineral Gray, Pearl Super Black, Pearl Ablaze Red, and Prime Cerulean Blue. The newly upgraded Suzuki Alto 800 STD puts emphasis on greater safety, enabling drivers to focus on the road and maximize the driving experience. The features upgrades equip the Alto with an anti-lock brake system and dual airbags both in the driver and passenger seats. Like the upgraded Celerio, the Alto 800 STD also features Suzuki’s TECT, which improves collision safety. The upgraded Alto 800 STD is available in color options Superior White, Silky Silver Metallic, Brilliant Yellow, Granite Grey, Blazing Red, Prime Mojito Green and Cerulean Blue. 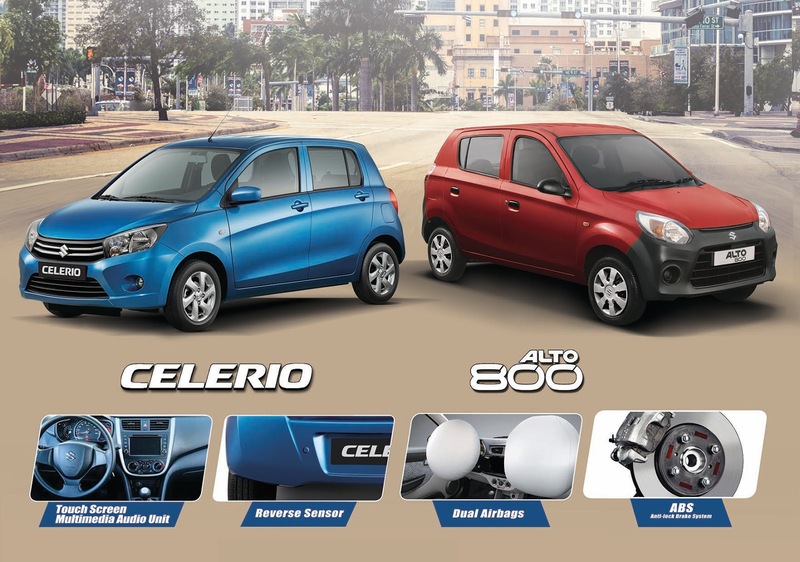 Enjoying the new safety features of both the Celerio and Alto has never been easier with low down-payment terms. Bring home a Celerio 1.0 GL-MT variant for as low as P58,000 and a Suzuki Alto 800 STD for only P28,000 until October 31, 2017.